New! Motif HR Plus Hair Removal – Especially advantageous when treating larger areas (i.e. legs), increased spot size enables treatment times that are two times faster. Combining optical energies (laser or light) with bi-polar radio frequency (RF) energy, proprietary elōs technology is the cornerstone of the elōs Plus system. We have one of the most advanced laser technologies available to reduce Hair Growth. This procedure involves 4-5 treatments spread out over a certain time frame (**Number of treatments and results will vary**). This essentially painless procedure allows for both large and small areas to be treated such as the face, arms, back, underarms, pelvic region. Shaving, electrolysis, waxing and tweezing will no longer be necessary. Package pricing is offered due to multiple treatments being required for maximum affect. We also offer Special Pricing for treating Multiple Areas, ie, Underarm/Bikini. 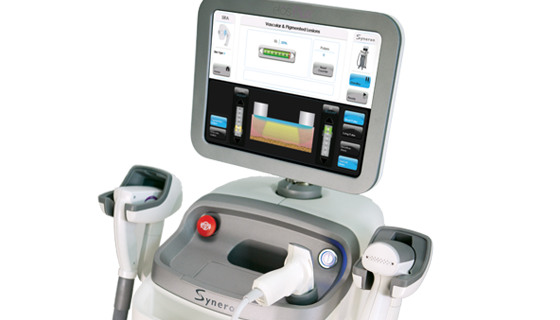 Our Syneron ™ Elos Plus Laser, with ELOS Technology, also provides treatment for Skin Rejuvenation, Photo Facials, Acne, Small Vessels of the face and Rosacea, Hyperpigmentation, and Skin Tightening/Improvement of the appearance of the skin. Again, package pricing is offered due to multiple treatments being recommended for maximum affect. There is minimal to NO downtime. This laser is FDA Approved for the indications and treatments we offer, and the results are incredible. It is also indicated for all skin types,. The length of treatment sessions vary depending on the indicated treatment as well as the area being treated, this is discussed during your complimentary consultation while making your treatment plan. Sublative™ enables you to achieve a more youthful appearance. This technology has been shown to effectively treat mild to moderate wrinkles, red and brown spots, and textural irregularities.